Click on this link to view and download! Comment, rate and favourite it if you have a blogskins account. thanks lots! Haha. 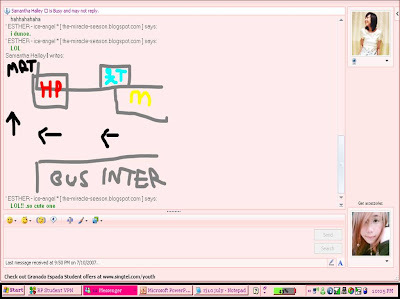 You know the msn messenger tool which we can draw things with? I always thought it's just for fun, until today when i realised the usefulness of it! I was asking Samantha about something and i dont know how to go there. She explained in words but to no avail, so she drew the map out! So cute lar! Lol. I wanted to blog about my crazy morning, but after writing one whole paragraph of it, i realised that no one would be interested. So i deleted the whole paragraph that i just wrote. Hahaha. Why do i always get sick ah.